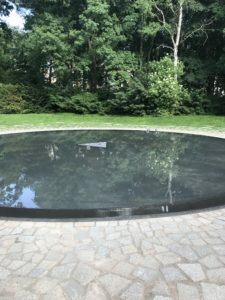 An experience that was particularly breathtaking and informative to me in Berlin, Germany, was the Sinti and Roma Memorial and the way which it was constructed. I feel that there is a lack of regard for diverse minority communities in several history courses that cover the Holocaust and World War II era. The hundreds of thousands of lives that were lost in addition to the Jewish population are often ignored by many. Those who are misinformed will place these people in the derogatory and broad category of “Gypsy” which belittles the actuality of their culture and takes away from their personal experiences in this atrocity. The Roma and Sinti Memorial is surrounded by rocks of many shapes and sizes, and features a triangle as an identification symbol during this time period. 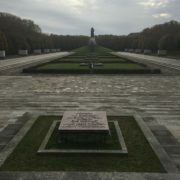 This memorial includes a multilingual written overview acknowledging the many lost lives of the Sinti and Roma during the Second World War. The secluded location gives one the ability to empathize with these groups as well as understand and analyze the intricacy of the memorial. To me the isolation of this installation was suggestive of the marginalization of the Sinti and Roma, who considered “asocial,” and deemed unfit for society during the Holocaust. This memorial may seem simple from afar, but it holds the deepest meaning. 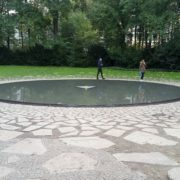 The shallow circular pond features a triangle in the middle, a symbol used by the Nazis to identify Roma and Sinti prisoners in concentration and death camps. During the Holocaust, these groups would be forced to wear a triangular badge on their prison uniforms, segregating them from other targeted groups. The pond is surrounded by hundreds of sparsely placed stones that are varying in size and angle, which I feel speak to the phenomena of brokenness of these years. The cracks in these stones are distinctively placed, showing the separation of these communities and the individuals’ relocations apart from one another. 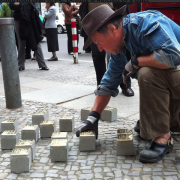 Each stone represents an individual story, where each piece is one fraction of a group that had been united with one another prior to these horrific events. The pattern of these stones also helps for us to understand the heartbreak faced by those who survived and lost their family members and close friends. A society that was once securely bonded began to fall apart resulting from destructive actions that these innocent people had no control over. I could notice a discrete sound of a violin playing in the background during my visit., Initially I did not recognize the valuable meaning behind it. Music is a central part of Roma and Sinti culture. 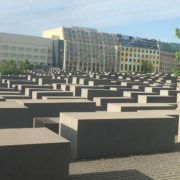 But for me, as I further continued to tour historical sites in the areas where the many crimes of the Holocaust took place, a connection came together. While viewing the remains of Auschwitz-Birkenau, I learned about the orchestras that some prisoners were required to participate in. 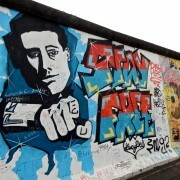 Prisoners would play music for the pleasure of the Germans while they were held in concentration camps. I felt that the music had a haunting undertone to it. Now that I have interconnected these two experiences, I can acknowledge that the music is played so eerily because it is representative of when the prisoners would begin their long and intensive work days, and how they could hear it from many points within the camps. The water in the pond is motionless and quiet as it is representative of the silence these people were forced to maintain and the extensive time frame that the prisoners spent in the same routine. There is no words or phrases that can possibly take us back to these times and make us feel the depth of what these people experienced, nor is it possible to picture the millions upon millions of lives lost through this destruction. The visit to the Memorial for Euthanasia Killings was an extremely heart-wrenching experience. 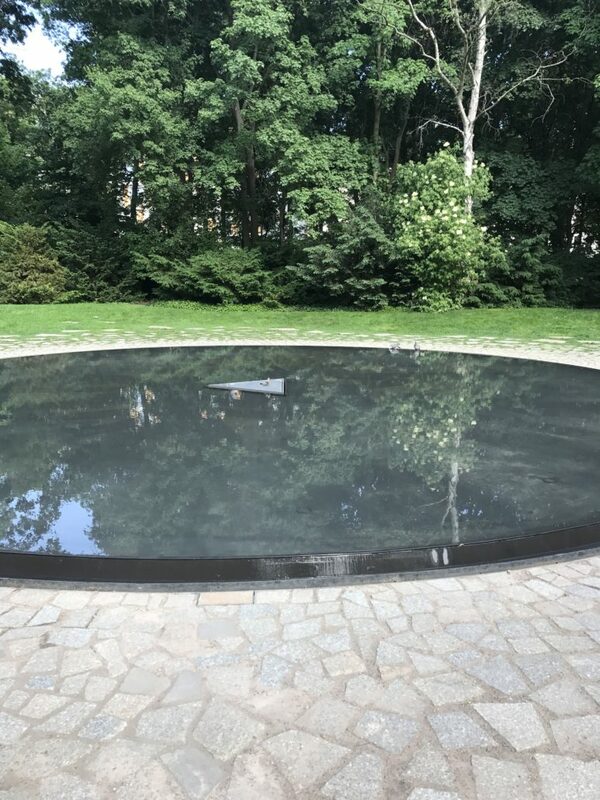 In an interesting and adequate way, the memorial commemorates the physically and mentally disabled victims of the Nazi policies. The design of the memorial was universally inclusive, to people of all cultures, races, and abilities. It was constructed in such a way that included many languages, simplified sentences for readers at all levels, and provided accessibility for the handicapped. What struck me the most about this ongoing mass euthanasia program was the strategic forethought that lead to faking death certificates. I was also disturbed by how perpetrators reacted on trial in the post-war era. In hopes of justifying their actions despite their blatant disregard for human lives, these criminals showed little remorse. This memorial is a solid way of not only remembering the victims, but making sure they receive the justice they deserve if only in memory. The disabled population was so negatively stigmatized and dismissed at this time that even after court cases were held and this was deemed inhumane in Germany, similar programs still continued throughout Europe. The names on these plaques will never go unnoticed, as this memorial is visible and highly informative to the public. 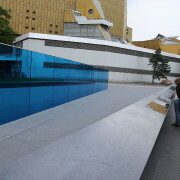 Both the Euthanasia Killings memorial and the Roma and Sinti memorial impacted me deeply, but I am left with a sense that the injustices will never be accounted for and there is no way to make up for the lives that have been lost.